[Update 9/11/2016:] I realized that my previous plan had a flaw – it wasn’t inclusive enough. I want to give my audience more, so I’m changing the plan slightly. I’ll still be including paper minis, but I’ll be creating a wider range of drawings to include in my Patreon stream now. In a related note, since I’ve switched to iOS for my daily computer, I’m no longer able to use Tablesmith (referenced below). I’m actually a little bit sad about that. Still, the show must go on, so I’ve built something out in Google Sheets which should do the trick, but more on that later. Okay, maybe that’s going a bit far. I have decided what I would like to do as a Patreon campaign: Paper Minis! I’ll be doing sets of characters/monsters that you can print out and use as minis for your tabletop gaming session. Patrons of even the lowest amount will get access to all minis that I create, and if you give more, you can influence what kind of minis I draw! I’ll be doing an initial set based on randomly generated descriptions using Bruce Gulke’s Tablesmith in order to finish the ‘setup’ of my profile on Patreon. Watch this space for a link to the page for the minis! Have any thoughts / suggestions / requests? Let me know in the comments below! 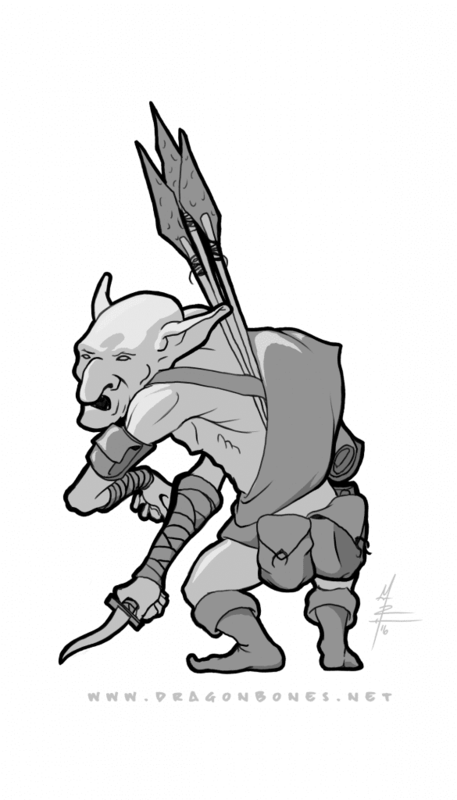 Tagged character portrait, drawing, gaming minis, goblin, goblins, greyscale, paper minis, patreon. Bookmark the permalink.